It’s the first official day of summer! Did you know the summer solstice is the longest day of the year? It is! 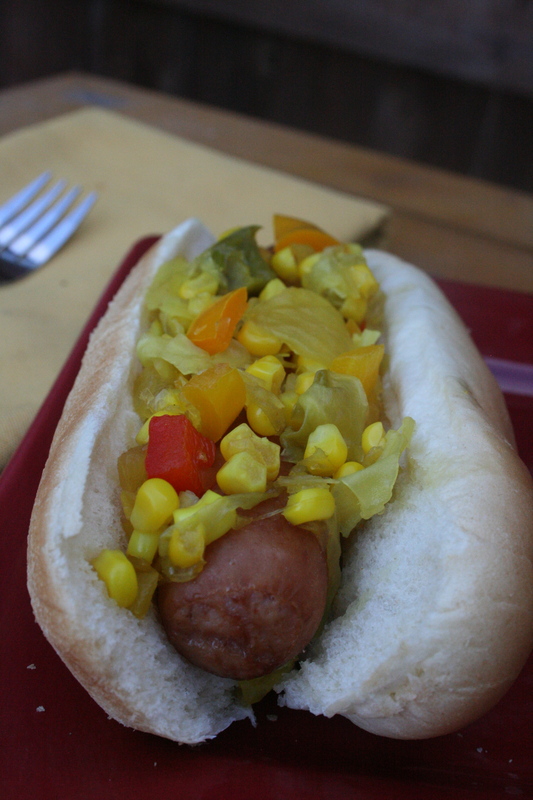 You should enjoy it by grilling up some bratwursts and slathering them with this summer twist on relish! Confession: This not only was my first time to make relish, but it also was my first time to eat relish. I don’t like pickles and I have spent my whole life thinking relish was just finely chopped pickles. However, with this version it is just like having all the grilled veggie side dishes right on top of the main course. How can you say no? 1. Heat spices, sugar, and vinegar in a large pot until the mixture begins to boil. 2. Add in veggies and heat the veggies are soft. 3. 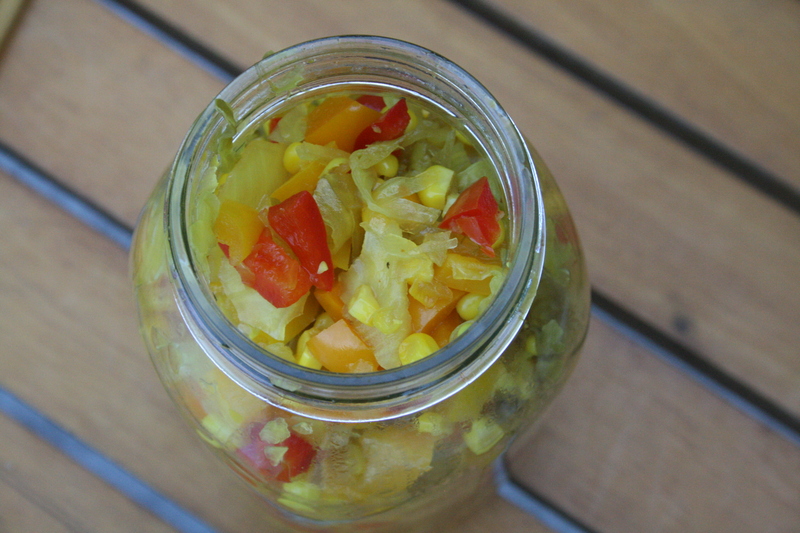 Using a slotted spoon, scoop the relish into mason jars. Let mixture cool completely before placing the glass jars in the fridge. 4. Serve relish over burgers, hot dogs, and chicken! This entry was posted in Side Dishes, Spreads and tagged bell peppers, corn, healthy eating, onions, relish, summer recipes, toppings. Bookmark the permalink. 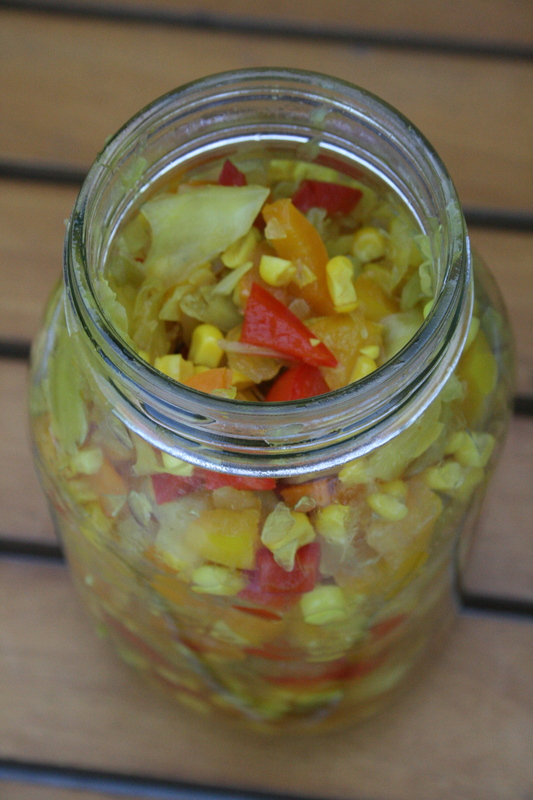 That is some seriously delicious looking relish! 🙂 Thank you so much for linking up with me this week at Tasty Tuesdays! I’ve pinned this & shared it with my followers! Please be sure to stop back by the party and check out some of the other links!